What can portable advertisements do for you and your business? 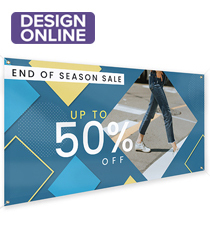 Colorful banner displays with digital printing provide strategic marketing where you need it most: at the source. Whether flying a feather flag outside your retail establishment or displaying a retractable graphics stand inside your trade show booth, these indispensable advertising fixtures pack the biggest promotional punch. Banner displays are, by design, tall by necessity because they need to stand out amongst the competition within the sea of convention attendees. Visitors will be drawn to your booth before they even set foot in it thanks to the visual cues these portable signs provide. 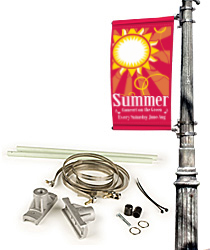 Our banner displays come with many options so let’s look at them with a little more detail. What advantages do these popular promotional signs have to offer? 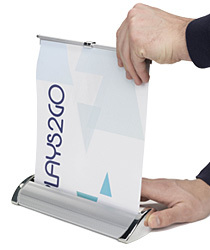 Retractable banner stands require very little time and effort to set up. Because of this, they are our best selling pop up display. 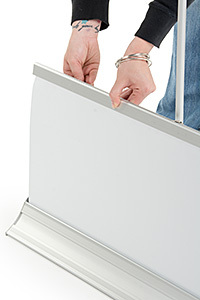 The aluminum base (which also stores and protects the graphic) comes with an extension pole that supports the banner once fully retracted. The display works not unlike a window shade; all you have to do is extend the pole and raise the banner. Since they are not mounted to anything, strategic placement is possible. This can be an advantage if you are promoting a new product inside a store or exhibiting at a trade show. Aim the banner stand at oncoming traffic for maximum exposure. 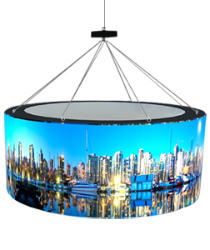 Once the promotion is over, the graphic retracts into the base and the entire unit can be quickly packed away in a small carrying case for easy transportation. 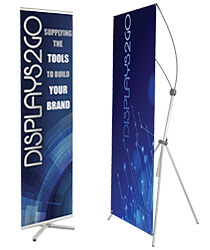 There are many retractable banner stand models to choose from, with black or silver anodized finishes and a wide selection of available widths. Some models even include optional spotlights to further highlight your banner and attract attention. 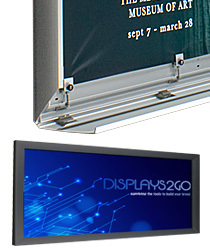 Non-retracting displays, sometimes called pole banner stands, are generally less expensive than the retractable models. The reason is that they do not require a spring-loaded mechanism inside a base, however there are advantages and disadvantages to this. The overall display consists of the graphic, a few support poles, and a simple cross-type base which comes in at considerably less cost than the retractable series. 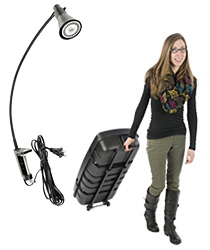 Thanks to their lighter weight, they are easier to travel with and ideal for trade show use. 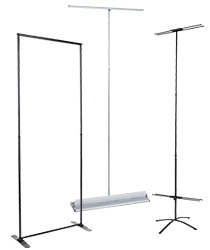 In addition, most of the support poles are adjustable, enabling some flexibility in setting the overall height. On the other hand, setting up is a bit more time-consuming and since there is no aluminum base to store and protect the banner, care must be taken when transporting the valuable graphic (the replacement cost for the digital print far outweighs the cost of the banner stand itself). But just like their retractable stand brethren, non-retractable stands come in all kinds of sizes and styles, probably more so in terms of variety. 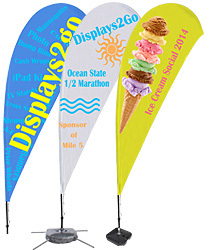 Advertising flags are a great way to make a memorable impact indoors or out. These printed cloth displays feature interesting feather and teardrop shapes, which definitely make an impression especially when multiple flags are displayed side-by-side. 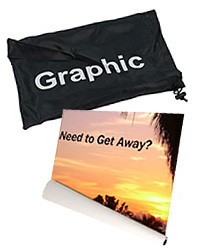 Custom graphics are imprinted onto the fabric in either one, two, three, or full-color options. As with most flags, these are printed on one side of the fabric only, creating a reverse image on the back. However, we also sell double-sided models that feature two printed layers of fabric sewn together so the flags read right in both directions. Three types of base options are available. 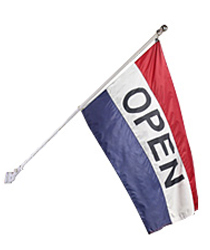 For indoor applications the flags are attached to cross-style bases. Outdoors, they can be inserted into fillable bases with sand or water added for ballast, or slid onto stakes that stick into the ground. 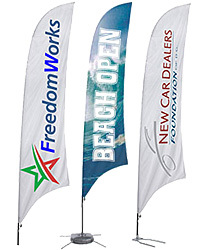 These flags, in addition to all exterior-rated displays we sell, are excellent choices for outdoor events, storefronts, and drive-thru entrances thanks to the visually appealing, fluttering action provided by the wind. Indoors the flags are just as useful inside tall atriums, showrooms, food courts, or any other large public facility where a little advertising helps to sell merchandise or services. 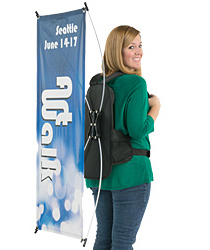 Backpack banners are mobile displays you wear as you walk around. A direct descendant from the old days of wearing two sandwich boards on the shoulders, these advertisers do the same thing yet in a much more comfortable manner (for the lucky person who gets to wear it). And if the lucky wearer is a people person who likes to sell, then this marketing product is a perfect match. What better way to announce a special promotion or event than speaking directly to people while simultaneously advertising full-color graphics on your back? This wearable display is designed like a typical backpack with padded shoulder straps for comfort. 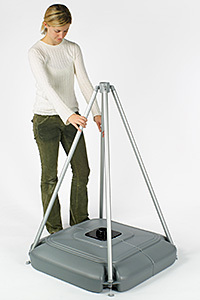 The body of the unit is fabricated from molded plastic. The printed banner is displayed behind you, leaving your hands free to hand out flyers or other information. Unlike the various free-standing displays mentioned above, the backpack banner display offers a remarkable means of mobile marketing, especially when the display can talk back. 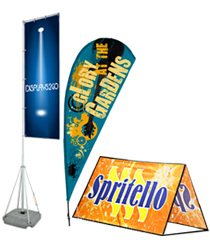 These are just some of the promotional tools for trade shows available in this large product category. Making your brand or business instantly recognizable is important if you want people to take notice. Any one of these eye-catching graphics displays, complete with bright and colorful graphics, can effectively garner the public's attention. Stay ahead of the competition by being aware of the needs of your establishment before deciding on which type of banner or flag is best for you. A well planned advertising strategy will not only result in more profits but can ultimately create more exposure for your brand, product, or service.